This year required an unusual level of resolve on my part. While delivering training and running a business, I was also able to write three books, two of which will be released soon by major publishers. I tell you this not to pat myself on the back, but to inform you about them and also use it as an opener to a new Blog series on resolve. These three books were each written with different methods and by a strange twist of fate two of them had to be delivered to the publisher on the same day. To say this was an incredible learning experience would be an understatement. It is plausible that I would agree to go through SEAL training again before attempting that silly stunt. But my resolve allowed them to get done and I am excited to kick them out of the nest. The first to be published, on December 26th, is The Way of the SEAL from Readers Digest publishing. It is about developing a SEAL-like mind-set for personal leadership. This book was pitched to me by an agent who insisted on a co-writer. Working with a co-writer was painful, but I am confident that the book turned out better for her efforts. The second book is 8 Weeks to SEALFIT, published in early 2014 by St. Martin’s Press. 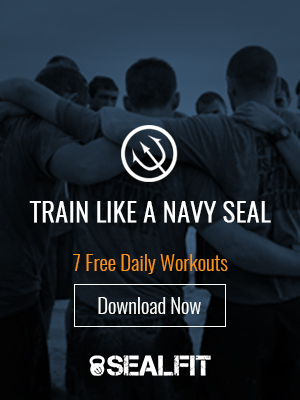 8 Weeks is the new version of our SEALFIT training bible and the sub-title “a Navy SEAL’s Guide to Unconventional Training for Physical and Mental Toughness” pretty much sums it up. To get this book done concurrently with the other, I hired a writing coach, who sent me weekly assignments. The third book I wrote this year is Unbeatable Mind, which is a 250 page version of an e-book I wrote for the Unbeatable Mind Academy. This book is actually my favorite and was the most fun to write – no co-writer or coach, just me. I am putting the finishing touches on it now and hope to have it self-published by year end. Now that I have updated you on these writing projects, let’s get back to the concept of resolve. It took considerable resolve to write three books in a year. Some may call it uncommon resolve. The same kind of resolve is required for any goal or project with an unreasonable level of challenge. Getting through SEAL training requires uncommon resolve. A BUD’s class is finishing Hell Week as I write this. They started with 175 students and now have 27 remaining after only four weeks of training. That means 148 of the trainees either got injured or lacked the resolve to go the distance. 1. Desire: you must desire the outcome as if your hair was on fire. 2. Belief: you must believe in your purpose, your mission, and yourself. 3. Attitude: you must have a positive attitude, drive and be able to mobilize a team with it. 4. Discipline: you must be willing to give up unnecessary attachments and commitments, and put in the right amount of daily effort toward your goal. 5. Determination: you must have an unwavering commitment to finish the job, stay the course, and never, ever quit. If your resolve requires stepping into the breach at risk of life or limb (as our friend Glen Doherty did in Benghazi), then you will require each of these attributes in full measure – a desire to serve, deep belief in your skills and the rightness of the action, an attitude of “will do” versus “I’ll try,” the discipline to pull it off and the determination to go the distance…regardless of the consequences. Imagine how powerful your actions would be if you applied these attributes with that same level of commitment to any goal in life? I dare you to try and find out! P.S. The Way of the SEAL is available now for pre-order at Amazon.com and you can get a signed copy from me at the Unbeatable Mind Retreat on December 6 to 8.